Florida Atlantic Head Coach Lane Kiffin met with members of the media on Sunday. Below are the highlights of his session, including team rebound, the play of Chris Robison, MTSU commentary, the loss of staff members, and special teams play. How do you get the guys to shake off the last two games and focus on beating Old Dominion? They actually came in today and had a team meeting. I talked to the leadership group today. We have to learn from it and move on. We talked about trying to find a way to win a game. We've found every way possible to lose a game. I mean the film is just mind-blowing and then to lose on the 2-point play. The kid (Middle Tennessee quarterback Brent Stockstill) is basically throwing a Hail Mary. He is not even throwing to the guy that caught it. He doesn't even seem him. He just chucks it up. A very difficult way to lose. With Chris Robison, what specifically is he struggling with? Is it getting the team in the right formation? Is it getting out of bad plays? What do you point to with that? At the end of the day, I think he is pressing. Trying to make every play. He really needs to relax out there and get back to how he was against Air Force. We talked about that. That game he was very relaxed because we had to sit in the locker room for two hours before the game. He just went out and played. He didn't let emotions get into it. He had a good first half (Saturday). The first half was good football all round, offense, defense and special teams. There was a lot of good stuff in there. We were on our way to a hard conference road win if we just keep playing like that. Unfortunately, we played about as bad as you could on offense. That is a very risky defense, a very aggressive defense. Everybody kinda knows that. They went up to Syracuse and won the year before. You gotta make the plays that are there. There is a number of plays that are there because they are taking a lot of risk and blitzing a lot of people, that are game changing plays. With Chris, how much confidence to you have in him? Do you see him responding to this and what are your thoughts of going into this week? We haven't figured out the stuff for this week. 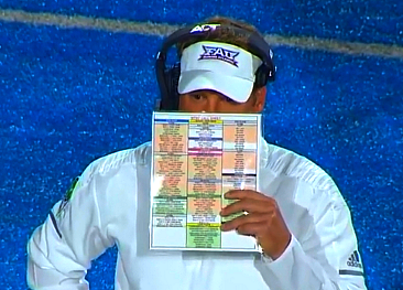 We just got through the game (watching the FAU at MT game film) and (will now) move on to the next one. We will get to that obviously tomorrow. If De'Andre (Johnson) or Rafe (Peavey) have a really good week at practice, would you be willing to reopen the quarterback battle? Yeah. Obviously we are not playing great there. So yeah, we are willing to do anything that will help us win. Along the lines of the Air Force calming influence, would it be beneficial for Robison to have someone else start and bring him in off the bench? Let him get into the game that way? I don't think so. If we had some preseason games maybe. I wouldn't want to do that to one of the other kids say 'hey you are the starter, but you are going to come out no matter what.' Whenever we have a starter, whoever starts the game is going to go until we make a change based on the performance within that game. It is just a tough game to get over with, to be in command like that. We did slow up a little bit. Our defense was playing good. When you are a hurry-up team, sometimes you have to slow up some to use some to use a little bit of clock and unfortunately that really bit us … It was just a lot of game-changing things happened in the game that were very frustrating how they went, whether it was drops that would have been huge plays. Obviously the 2-point play, where it was all covered. Like a smart quarterback, it is a 2-point play, if that would have been second or third down, he would have thrown the ball away. He is just chucking it up. Actually, the two guys that it looks like he is throwing to have already stepped out of bounds. They weren't even eligible to catch the ball. This other guy comes out from the other side, he is not even looking to catch the ball. We make a first down, they review it and move it back two full yards, but we don't know it because the sticks on our side haven't been set and moved back properly. We think it is 4th-and-inches and it is 4th-and-a-yard-and-a-half. There are some very hard things to get over in that game. It seems the team took their foot off the pedal. What can be done about that? Is it a mentality or what can fix that going forward? Well, it is a little different than that. In that (Bethune-Cookman) I thought we let up on offense and defense both. Obviously, we subbed some guys in the Bethune game. This one was really an offensive issue in the second half. The defense was getting us the ball back on offense. It's just hard to even watch. It looks like two totally different games. You watch the first couple of series, whatever 16 plays 76 yards, the third series, it think it's a touchdown and then all of a sudden, we are struggling to even make a first down. Is there any update on James Pierre? With Charlie Weis, he obviously has the football knowledge, but with these game situations, he hasn't been either the guy in command or he hasn't really been the position coach. Is that something that he is growing into? Is he where you would like him to be at this point? How do you assess that? He is doing a good job. Everybody continues to get better and continues to coach. We talked early in the year, that is one of the things that we aren't as used to. At a big program, you look forward to keeping your guys. Obviously here, we lost half our staff, both coordinators and half the staff. We are a very young staff. I want to say that seven of the 10 guys, this might be their first fulltime job. So with that, there is good and bad. They are hungry. They are eager, but we don't have a lot of game experience, or just situational experience with the kids. It is just part of it. Is that a big factor do you think, or was a big thing when the season started? It is what it is. It is the situation you are in. You have turnover. A lot of the guys it is their first job. No different than freshmen players. There is growth within there. We all get better with experience. With the special teams, you mentioned a couple of weeks ago changing some personnel around. Are you still confident in Sabastian (Riella) at punter or could you see maybe Austin (Laszewski) getting more snaps there? I don't know that right now. We are not anticipating any changes there. We made some changes with some younger guys over the last couple of weeks playing on certain units. I think we have played better on special teams the last couple of weeks than we did earlier. That field goal attempt that didn't go so well, was that a called fake or was the snap low and Jake (Stoshak) tried to make the most of it? It was a bad snap. It seems like the special teams play, something has gone wrong basically every game, even though you got that nice block from Hunter (Snyder). It started out well. Are you seeing progress at all out of that unit and how do you get that progress? Our kickoff coverage, for the most part, have been really good, one of the better units around the country. Kicker being hurt has been an issue obviously. He did come back and make a big field goal yesterday (Saturday). We had our punting issues early on. Our kickoff return a couple of weeks ago was good. I think it has really been for the most part, the big issue has been that our kicker has been hurt and our punting. Did you have an idea of how far you needed to get into Middle Tennessee's territory to be able to feel comfortable with a kick? You just try to get as close as you can until you run out of time. Obviously we didn't get close.